Charles Hard Townes (July 28, 1915 – January 27, 2015) was an American physicist and inventor of the maser. Townes worked on the theory and application of the maser, for which he obtained the fundamental patent, and other work in quantum electronics associated with both maser and laser devices. He shared the 1964 Nobel Prize in Physics with Nikolay Basov and Alexander Prokhorov. Townes was an adviser to the United States Government, meeting every US President from Harry Truman (1945) to Bill Clinton (1999). He directed the US government Science and Technology Advisory Committee for the Apollo lunar landing program. After becoming a professor of the University of California at Berkeley in 1967, he began an astrophysical program that produced several important discoveries, for example, the black hole at the center of the Milky Way galaxy. Townes was religious and believed that science and religion are converging to provide a greater understanding of the nature and purpose of the universe. Of ethnic German as well as a great deal of ethnic Scottish, English, Welsh, Huguenot French and Scotch Irish ancestry, Townes was born in Greenville, South Carolina, the son of Henry Keith Townes (1876–1958), an attorney, and Ellen Sumter Townes (née Hard; 1881–1980). He earned his B.S. in Physics and B.A. in Modern Languages at Furman University, where he graduated in 1935. Townes completed work for the Master of Arts degree in physics at Duke University during 1937, and then began graduate school at the California Institute of Technology, from which he received a Ph.D. degree in 1939. During World War II, he worked on radar bombing systems at Bell Labs. In 1950, Townes was appointed Professor at Columbia University. He served as Executive Director of the Columbia Radiation Laboratory from 1950 to 1952. He was Chairman of the Physics Department from 1952 to 1955. In 1951, Townes conceived a new way to create intense, precise beams of coherent radiation, for which he invented the acronym maser (for Microwave Amplification by Stimulated Emission of Radiation). When the same principle was applied to higher frequencies, the term laser was used (the word "light" substituting for the word "microwave"). During 1953, Townes, James P. Gordon, and H. J. Zeiger built the first ammonia maser at Columbia University. This device used stimulated emission in a stream of energized ammonia molecules to produce amplification of microwaves at a frequency of about 24.0 gigahertz. From 1959 to 1961, he was on leave of absence from Columbia University to serve as Vice President and Director of Research of the Institute for Defense Analyses in Washington, D.C., a nonprofit organization, which advised the U.S. government and was operated by eleven universities. Between 1961 and 1967, Townes served as both Provost and Professor of Physics at the Massachusetts Institute of Technology. Then, during 1967, he was appointed as a Professor of Physics at the University of California at Berkeley, where he remained for almost 50 years; his status was as professor emeritus by the time of his death during 2015. Between 1966 and 1970, he was chairman of the NASA Science Advisory Committee for the Apollo lunar landing program. For his creation of the maser, Townes along with Nikolay Basov and Alexander Prokhorov received the 1964 Nobel Prize in Physics. Townes also developed the use of masers and lasers for astronomy, was part of a team that first discovered complex molecules in space, and determined the mass of the supermassive black hole at the centre of the Milky Way galaxy. During 2002–2003, Townes served as a Karl Schwarzschild Lecturer in Germany and the Birla Lecturer and Schroedinger Lecturer in India. 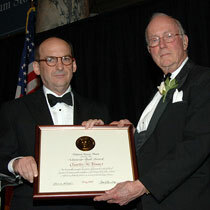 This information is drawn from the authoritative oral history on Charles Townes done by the Bancroft Library at the University of California at Berkeley and underwritten by the Sloan Foundation. Refer to other aspects of his life too. When Townes failed to be promoted to President of MIT during 1967, he accepted an offer from Clark Kerr to join the University of California at Berkeley and begin an astrophysical program. Townes soon began searching for molecules in space. At the time most astronomers thought that molecules could not exist in space because ultraviolet rays would destroy them. Townes eventually discovered ammonia and water in dust clouds, which shielded them from damaging rays, by essentially doing microwave spectroscopy on the sky. This created the topic of molecular/millimeter astronomy, which continues to find many complex molecules, some the precursors to life. The center of the Milky Way had long puzzled astronomers, and thick dust obscures the view of it in visible light. During the mid to late 1970s, Townes together with Eric Wollman, John Lacy, Thomas Geballe and Fred Baas studied Sagittarius A, the H II region at the galactic center, at infrared wavelengths. They observed ionized neon gas swirling around the center at such velocities that the mass at the very center must be approximately equal to that of 3 million suns. Such a large mass in such a small space implied that the central object (the radio source Sagittarius A*) contains a supermassive black hole. Sagittarius A* was one of the first black holes detected; its mass has been more accurately determined to be 4.3 million solar masses. Townes' last major technological creation was the Infrared Spatial Interferometer with Walt Fitelson, Ed Wishnow and others. The project combined three mobile infrared detectors aligned by lasers that study the same star. If each telescope is 10 meters from the other, it creates an impression of a 30-meter lens. Observations of Betelgeuse, a red giant in the shoulder of the constellation Orion, found that it is increasing and decreasing in size at the rate of 1% per year, 15% over 15 years. ISI produces extremely high angular and spatial resolution. The technology is also playing an important role in the search for extraterrestrial life in collaborations with Dan Werthimer of SETI. Townes married Frances H. Brown, an activist for the homeless, during 1941. They lived in Berkeley, California and had four daughters, Linda Rosenwein, Ellen Anderson, Carla Kessler, and Holly Townes. A religious man and a member of the United Church of Christ, Townes believed that "science and religion [are] quite parallel, much more similar than most people think and that in the long run, they must converge". He wrote in a statement after winning the Templeton Prize during 2005: "Science tries to understand what our universe is like and how it works, including us humans. Religion is aimed at understanding the purpose and meaning of our universe, including our own lives. If the universe has a purpose or meaning, this must be reflected in its structure and functioning, and hence in science." Townes died at the age of 99 in Oakland, California, on January 27, 2015. "He was one of the most important experimental physicists of the last century," Reinhard Genzel, a professor of physics at Berkeley, said of Townes. "His strength was his curiosity and his unshakable optimism, based on his deep Christian spirituality." Faith. Townes argued that the scientist has faith much like a religious person does, allowing him/her to work for years for an uncertain result. Revelation. Townes claimed that many important scientific discoveries, like his invention of the maser/laser, occurred as a "flash" much more akin to religious revelation than interpreting data. Proof. During this century the mathematician Godel discovered there can be no absolute proof in a scientific sense. Every proof requires a set of assumptions, and there is no way to check if those assumptions are self-consistent because other assumptions would be required. Uncertainty. Townes believed that we should be open-minded to a better understanding of science and religion in the future. This will require us to modify our theories, but not abandon them. For example, at the start of the 20th century physics was largely deterministic. But when scientists began studying the quantum mechanics they realized that indeterminism and chance play a role in our universe. Both classical physics and quantum mechanics are correct and work well within their own bailiwick, and continue to be taught to students. Similarly, Townes believes growth of religious understanding will modify, but not make us abandon, our classic religious beliefs. Gordon, J.; Zeiger, H.; Townes, Charles (1955). "The Maser—New Type of Microwave Amplifier, Frequency Standard, and Spectrometer". Physical Review. 99 (4): 1264–1274. Bibcode:1955PhRv...99.1264G. doi:10.1103/PhysRev.99.1264. Shimoda, K.; Wang, T.; Townes, Charles (1956). "Further Aspects of the Theory of the Maser". Physical Review. 102 (5): 1308–1321. Bibcode:1956PhRv..102.1308S. doi:10.1103/PhysRev.102.1308. Schawlow, Arthur; Townes, Charles (1958). "Infrared and Optical Masers". Physical Review. 112 (6): 1940–1949. Bibcode:1958PhRv..112.1940S. doi:10.1103/PhysRev.112.1940. Townes, Charles (1999). How the Laser Happened: Adventures Of a Scientist. Oxford University Press. ISBN 978-0-19-512268-8. Townes, Charles; Schawlow, Arthur (1955). Microwave Spectroscopy. McGraw-Hill. ISBN 978-0-07-065095-4. Townes, Charles (1995). Making Waves. American Institute of Physics Press. ISBN 978-1-56396-381-0. Townes was widely recognized for his scientific work and leadership. 1956 — elected Full Member of the National Academy of Sciences. 1957 — elected Fellow of the American Academy of Arts and Sciences. 1958 — awarded the Comstock Prize in Physics from the National Academy of Science. 1959 — awarded the Richtmyer Memorial Award from the American Association of Physics Teachers. 1961 — awarded the David Sarnoff Electronics Award given by the Institute of Electrical and Electronics Engineers, and the Rumford Prize awarded by the American Academy of Arts and Sciences. 1962 — The John J. Carty Award for the Advancement of Science given by the National Academy of Science. 1962 — Stuart Ballantine Medal given by The Franklin Institute. 1963 — Young Medal and Prize, for distinguished research in the field of optics presented by the Institute of Physics. 1964 — Nobel Prize in Physics with Nikolay Basov and Aleksandr Prokhorov for contributions to fundamental work in quantum electronics leading to the development of the maser and laser. 1970 — Wilhelm Exner Medal. 1979 — He was awarded the Niels Bohr international medal, for contributions to the peaceful use of atomic energy. 1980 — Townes was inducted by his home state into the South Carolina Hall of Science and Technology, and has also been awarded a South Carolina Hall of Science and Technology Citation. 1982 — He received the National Medal of Science, presented by President Ronald Reagan. 1983 — appointed to the Pontifical Academy of Sciences. 1994 — elected Foreign Member of the Russian Academy of Sciences. 1998 — awarded the Henry Norris Russell Lectureship by the American Astronomical Society. 2000 — awarded the Lomonosov Gold Medal by the Russian Academy of Sciences. 2003 — awarded the Telluride Tech Festival Award of Technology in Telluride, Colorado. 2004 — awarded the Italian Society of Optics and Photonics (SIOF) "Galileo" medal. 2005 — awarded the Templeton Prize for "Progress Toward Research or Discoveries about Spiritual Realities." He has also been awarded the LeConte Medallion. 2008 — On May 24 Townes received an Honorary Doctorate of Humane Letters from the University of Redlands. 2011 —On May 14 Townes received an Honorary Doctorate of Science from Texas A&M University. 2012 — awarded the Golden Goose Award for government-funded research with unexpected applications. This page is based on the Wikipedia article Charles H. Townes; it is used under the Creative Commons Attribution-ShareAlike 3.0 Unported License (CC-BY-SA). You may redistribute it, verbatim or modified, providing that you comply with the terms of the CC-BY-SA.